Daria Motamedi, MD, is an Assistant Professor of Clinical Radiology, Director of Musculoskeletal Ultrasound, and Quality Champion for the Musculoskeletal Imaging Section in the Department of Radiology and Biomedical Imaging at the University of California, San Francisco. In 2006, Dr. Motamedi received his medical degree from the University of Minnesota, Minneapolis. 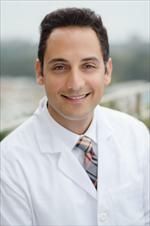 He completed a one-year Transitional Medicine internship at UCLA in 2007 and a four-year Diagnostic Radiology residency at Cedars-Sinai/UCLA Medical Center in 2011, followed by a Musculoskeletal Imaging fellowship with Dr. Donald Resnick at UCSD. In 2013, he joined the UCSF Musculoskeletal Imaging faculty as an Assistant Professor of Clinical Radiology. Dr. Motamedi is a member of the Society of Skeletal Radiology, the European Society of Skeletal Radiology, the Radiological Society of North America, the American Roentgen Ray Society, and the American Academy of Orthopedic Surgeons. Also, he is an invited member of the Society of Academic Bone Radiologists, a society consisting of the top national practitioners in his field. Dr. Motamedi has written 14 book chapters and published 21 peer-reviewed articles and 41 abstracts. Dr. Motamedi lectures nationally and internationally on topics related to musculoskeletal imaging, sports medicine imaging, and musculoskeletal ultrasound. Dr. Motamedi is a founding member of the UCSF Musculoskeletal Ultrasound Committee and a member of the UCSF Diagnostic Radiology Residency Committee. Dr. Motamedi serves on committees for the two largest radiological societies in North America, including the RSNA Scientific Program Committee and the ARRS Live Programming/Item Writing Committee. He also serves on the Research Committee for the Society of Skeletal Radiology. Dr. Motamedi is a reviewer for Skeletal Radiology, Clinical Imaging, and Diagnostic and Interventional Radiology. Orthopedic MRI and Musculoskeletal Ultrasound. Sports medicine/sports imaging, diagnostic and interventional musculoskeletal ultrasound, and artificial intelligence and deep learning imaging applications. Morgan TA, Motamedi D. Incorporating musculoskeletal ultrasound into your radiology practice: patients, patience, and why your department cannot do without it. Skeletal Radiol. 2019 Feb; 48(2):191-194. Lansdown DA, Bendich I, Motamedi D, Feeley BT. Imaging-Based Prevalence of Superior Labral Anterior-Posterior Tears Significantly Increases in the Aging Shoulder. Orthop J Sports Med. 2018 Sep; 6(9):2325967118797065. Bauer AH, Bonham J, Gutierrez L, Hsiao EC, Motamedi D. Fibrodysplasia ossificans progressiva: a current review of imaging findings. Skeletal Radiol. 2018 Aug; 47(8):1043-1050. Lau BC, Motamedi D, Luke A. Use of Pocket-Sized Ultrasound Device in the Diagnosis of Shoulder Pathology. Clin J Sport Med. 2018 Feb 14. Holmes MG, Foss E, Joseph G, Foye A, Beckett B, Motamedi D, Youngren J, Thomas GV, Huang J, Aggarwal R, Alumkal JJ, Beer TM, Small EJ, Link TM. CT-Guided Bone Biopsies in Metastatic Castration-Resistant Prostate Cancer: Factors Predictive of Maximum Tumor Yield. J Vasc Interv Radiol. 2017 Aug; 28(8):1073-1081.e1. Lau BC, Robertson A, Motamedi D, Lee N. The Validity and Reliability of a Pocket-Sized Ultrasound to Diagnose Distal Radius Fracture and Assess Quality of Closed Reduction. J Hand Surg Am. 2017 Jun; 42(6):420-427. Gutierrez LB, Link T, Chaganti K, Motamedi D. Arterial calcification due to CD73 deficiency (ACDC): imaging manifestations of ectopic mineralization. Skeletal Radiol. 2016 Nov; 45(11):1583-7. Gutierrez L, Morgan T, Feeley B, Link T, Motamedi D. Utility of Musculoskeletal Ultrasound in the Diagnosis and Treatment of Suprapatellar Fat Pad Impingement: A Case Report. J Clin Case Rep. 2016; 837(6). Bahoush G, Motamedi D, Vossough P. Initial lymphocyte count in patients with acute immune thrombocytopenic purpura: Can it predict persistence of the disease? Minerva Pediatr. 2014 Dec 12. Modarresi S, Motamedi D, Jude CM. Superior labral anteroposterior lesions of the shoulder: part 1, anatomy and anatomic variants. AJR Am J Roentgenol. 2011 Sep; 197(3):596-603. Modarresi S, Motamedi D, Jude CM. Superior labral anteroposterior lesions of the shoulder: part 2, mechanisms and classification. AJR Am J Roentgenol. 2011 Sep; 197(3):604-11. Motamedi D, Learch TJ, Ishimitsu DN, Motamedi K, Katz MD, Brien EW, Menendez L. Thermal ablation of osteoid osteoma: overview and step-by-step guide. Radiographics. 2009 Nov; 29(7):2127-41. Srivatsan ES, Chakrabarti R, Zainabadi K, Pack SD, Benyamini P, Mendonca MS, Yang PK, Kang K, Motamedi D, Sawicki MP, Zhuang Z, Jesudasan RA, Bengtsson U, Sun C, Roe BA, Stanbridge EJ, Wilczynski SP, Redpath JL. Localization of deletion to a 300 Kb interval of chromosome 11q13 in cervical cancer. Oncogene. 2002 Aug 15; 21(36):5631-42.